In 2010, Dreamworks announced that it would be making a film as a continuation to the hugely successful 8 Mile. The film was to be called Southpaw, and would star Eminem as a has-been boxer fighting to reassemble the pieces of his life. This movie is finally coming out this summer, but is Southpaw an 8 Mile sequel? Anyone who has heard of the film knows that it stars Jake Gyllenhaal, not Eminem... so how could it be a continuation of the rapper's breakout role? 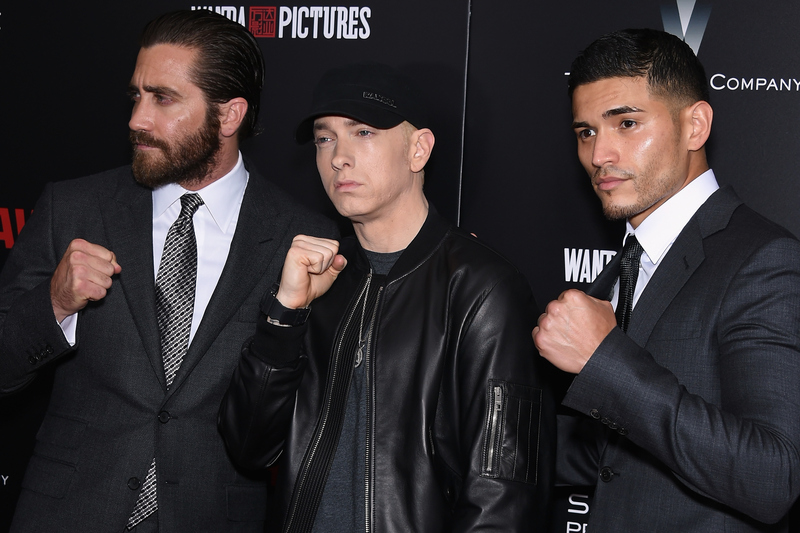 Basically, Eminem was associated with Southpaw from its inception, and for a while the project looked like a sure thing. But according to producer Alan Riche, one day the studio got a call from Eminem's team saying that the rapper would be unable to commit to the film. Riche revealed to Business Insider, “We were told that he really loved it, but that he feels he’s a musician first and an actor second and he had a lot of inner energy going on for his next album and that’s where his muse was taking him." In an interview with Zane Lowe, Eminem stated that he would've been unable to film for Southpaw due to conflicts with his recording schedule for The Marshall Mathers LP 2. However, he expressed his support for the project, saying "I wouldn't change a thing. Jake smashed it." And you know what? I have to agree. Even though a bona fide 8 Mile sequel would have been awesome, Southpaw stands on its own as a quality film while also paying homage to the powerful themes present in 8 Mile. Redemption, family issues, an underdog fighting to overcome seemingly insurmountable odds — all of these are prevalent topics in Southpaw, just as they were in 8 Mile. But because said themes are explored through the lens of a new character, they seem fresh and pertinent as opposed to weary. Other similarities between the two films include scenes of emotional confrontation, a flawed but strong female romantic partner, and...vomiting. Yes, just as in 8 Mile, Southpaw features instances of characters tossing their cookies. But at least it seems slightly more in place in an excruciatingly physical sports movie than it did in 8 Mile. John Oliver put it best: "Eminem, why did your mom make you spaghetti? She knew tonight was rap battle night." But I digress. The bottom line is, although Southpaw might not be a sequel to 8 Mile as originally intended, it is still a captivating film that explores some heartwrenching themes. I would argue that Gyllenhaal's replacement of Eminem even has the potential to make Southpaw more powerful because we won't constantly be comparing his character to 8 Mile. Those who are still sad about Eminem's absence can take solace in the fact that the rapper produced the Southpaw soundtrack, which includes a few of his own tracks. So even if Eminem isn't physically in the movie, his presence is definitely felt.